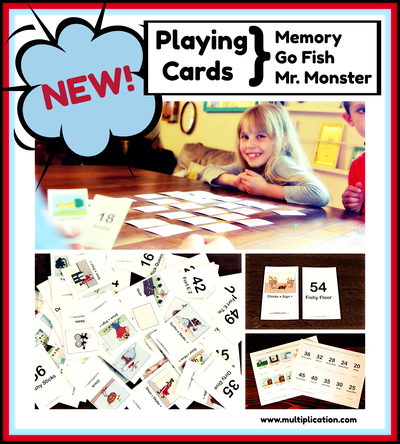 With Multiplication.com's unique story pictures on half the cards, and the matching story answers on the other half, kids will pick up times table fluency in no time. You can print all 4 sets at once, or concentrate on 1 set at a time (recommended if you are a new user). For more players, simply print off extra copies of the same set. Share with all your teaching friends! With these playing cards, students can play the following games (click on the image of the particular card game you want to play below. Make this the best year ever with our free playing cards!